We are a leading Manufacturer of rubber bellows from Delhi, India. 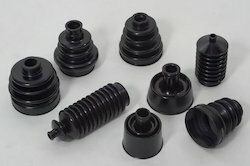 Made using premium quality rubber procured from our trustworthy vendors, the offered range of Rubber Bellows finds high demand in the industry. These devices are made available in various shapes and sizes and are used to provide pressurized air at controlled locations in controlled quantities. The offered range provides excellent resistance to high temperatures, chemicals and corrosion.